Edward Behrens, London. Inheritance from the Estate of Peter A. B. Widener by gift through power of appointment of Joseph E. Widener, Elkins Park, Pennsylvania; gift 1942 to NGA. François Boucher in North American Collections: One Hundred Drawings, National Gallery of Art, Washington, D.C.; Art Institute of Chicago, 1973-1974, unnumbered brochure titled François Boucher: Influence and Versatility (shown only in Washington). Manufacture royale de Beauvais. Prix des Ouvrages et Comptes des Ouvrages: Années 1746 à 1753. Mobilier National, Archives, Paris, 1752-1754: B166: fols. 228v-231. Badin, Jules. La Manufacture de Tapisseries de Beauvais depuis ses origines jusqu'à nos jours. Paris, 1909: 62. McCall, George Henry. The Joseph Widener Collection. Tapestries at Lynnewood Hall, Elkins Park, Pennsylvania. Philadelphia, 1932: 36-38, no. X, color repro. ; 81-83, repro. Inventory of the Objects d'Art at Lynnewood Hall, Elkins Park, Pennsylvania, The Estate of the Late P.A.B. Widener. Philadelphia, 1935: 123-124. Jarry, Madeleine. "The Wealth of Boucher Tapestries in American Museums." Antiques 102 (August 1972): 224. Standen, Edith Appleton. European Post-Medieval Tapestries and Related Hangings in The Metropolitan Museum of Art. New York, 1985: 2:547, 548 n. 19. Brunel, Georges. Boucher. New York, 1986: fig. 123. Standen, Edith Appleton. "Boucher as a Tapestry Designer." In Georges Brunel, Boucher, Paris, 1986: 333. Standen, Edith Appleton. 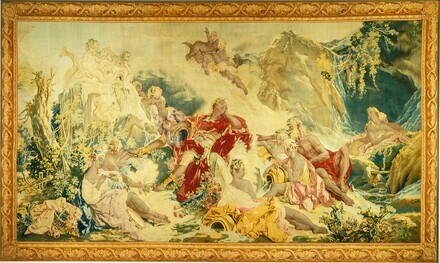 "The Fragments d'Opéra: A Series of Beauvais Tapestries After Boucher." Metropolitan Museum Journal 21 (1986): 124-127, fig. 1.